Tonight I got the opportunity to work 1 on 1 with one of my Black Belts (Mr. Dupree)! We started training with various koryu bojutsu kata, then finished the night studying from the Ninpiden! The Ninpiden is a Historical Ninjutsu Densho, written by Hattori Hanzo in 1560! 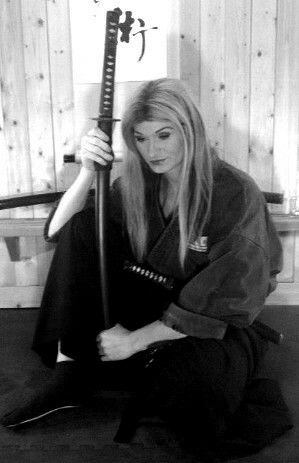 Want to train in authentic ninja & samurai martial arts but don’t live near a Dojo? Join the Budo Ryu Kai Online Ninjutsu Dojo and start training today! This entry was posted on March 12, 2018 by Soke Anshu. It was filed under Uncategorized and was tagged with Anshu Christa Jacobson, Authentic, Authentic Bujutsu, authentic ninjutsu, Budo, budo ryu kai, budo ryu ninjutsu, Bujutsu, classical, Historical, Koryu, Ninja, Ninjutsu, Ninpo, Real, Samurai, soke anshu.